NEW DELHI: VIAVI Solutions released the results of its 11th annual State of the Network global study today. 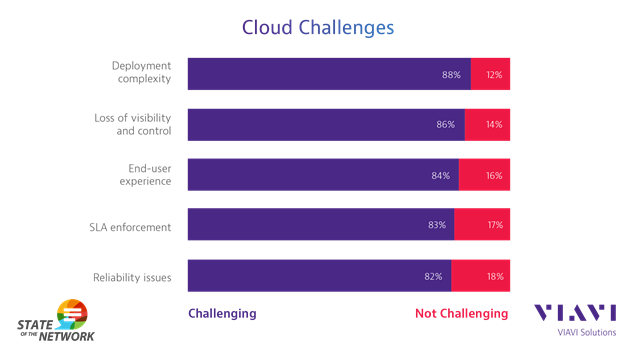 Findings demonstrate that a significant portion of enterprise IT teams are unsure how to handle cloud migration challenges. The annual study was compiled from the insights of over 600 respondents, including network engineers, IT directors and CIOs from around the world. “Based on this year’s State of the Network, you’ve really got to feel for enterprise IT teams,” said Douglas Roberts, Vice President and General Manager, Enterprise & Cloud Business Unit, VIAVI Solutions. “They’re losing control of infrastructure and services that are migrating to the cloud, while simultaneously supporting employees who may be working anywhere and yet remain on the hook to maintain performance and resolve issues. They need solutions to increase their scope of visibility and speed of response, as well as smarter analytics,” Roberts added. · IT teams responsible for resolving cloud issues: Sixty-five percent of respondents said network teams were responsible for troubleshooting cloud issues, while 11 percent were unsure and 24 percent said they were not. Underlying the significance of this finding is that network teams may not be involved in the initial migration to the cloud, as that may have been decided and implemented within a business unit. · Employees accessing resources remotely: Over ninety percent of enterprises have some portion of their workforce accessing network or application services from a remote site, with 54 percent saying a quarter of their employees are doing so. · Application performance monitoring challenges: Fifty-two percent of respondents said their top challenge was determining whether problems are caused by the network, application or system – this was also cited as a top challenge in 2017. This year the issue outweighed others by a wide margin, including: managing application bugs and patches (16 percent), measuring latency and delay issues (13 percent), understanding user experience (10 percent) and monitoring bandwidth consumption (9 percent). · Emerging technology deployments: Enterprises continue to aggressively adopt new technologies, including server virtualization (79 percent), private cloud (60 percent), public cloud (56 percent), software-defined networks (43 percent), 40 GbE (43 percent) and 100 GbE (27 percent). · Bandwidth demand growth: One driver of emerging technology adoption is bandwidth demand growth, with enterprises forecasting an ongoing surge. Between 2018 and 2020, 42 percent expect demand to grow 51-100 percent, 40 percent expect growth up to 50 percent and 18 percent expect growth of more than 100 percent. Four Key Takeaways: What should IT service delivery teams do? · Adopt a Cloud by Default Approach: Understand that if you’re not monitoring in the cloud, you soon will be. Whether your company is moving to AWS, Microsoft Azure, or another provider, your network team should be able to spin up solutions to extend visibility and performance analysis from your local datacenter out to any infrastructure as a service (IaaS) vendor. · Don’t be SaaS’ed: What visibility do engineers have into software as a service (SaaS) being accessed through their networks? When users complain of issues, how will they exonerate or fix any related network issues? Many existing network tools can’t provide performance insight into SaaS applications. Engineers need to be able to provide metrics on network connectivity to any sort of cloud service. · Achieve End-to-End Coverage: With applications being delivered across a hybrid architecture both in the cloud and on-premises, engineers need full path visibility and insight into the journey of applications from the user to the cloud, to the datacenter and back. Any pieces missing from the trip jeopardize the ability of IT to accurately pinpoint and resolve breakdowns. · Gain Remote User Intelligence: As users can access services from anywhere and complain about erratic issues with a high level of subjectivity, how do engineers verify and troubleshoot remote complaints? A new use case for an old technology is synthetic testing in the form of lightweight agents that are downloaded. These agents help to clarify, from the remote user perspective, what’s occurring when those users access critical services.